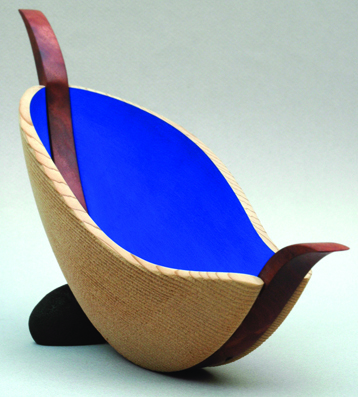 This sculptor and creator of wooden artworks is developing his own style. His excellent technical knowledge and management of the material allows him to create works that possess numerous symbolic meanings. Potočnik’s art reveals beginnings, developments, and new births, squirming from their wrappers and rolling away like small beads. 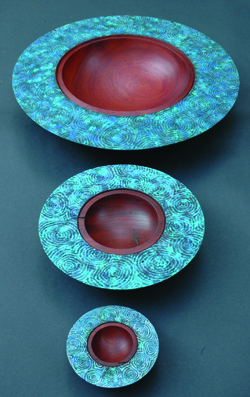 In different practical forms – three bowls – he also completes the forms with ornamentation. Andrew was born in Melbourne. 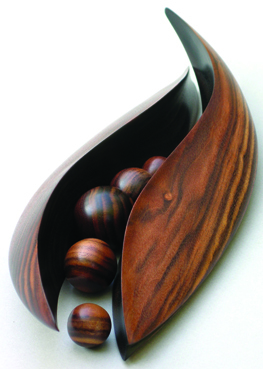 “For as long as I can remember I have been interested in wood, but was encouraged to explore its potential while at secondary school. 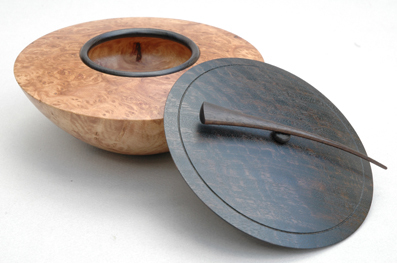 It was during this time that I found myself attracted to the lathe – to explore many forms in a relatively short time and to transform small interesting pieces of wood into objects that highlighted the timber’s natural beauty. While studying to be a teacher I was exposed to new ideas, materials and techniques and gathered information from specialists in their fields. I had the time and the facilities to develop new ideas and skills. 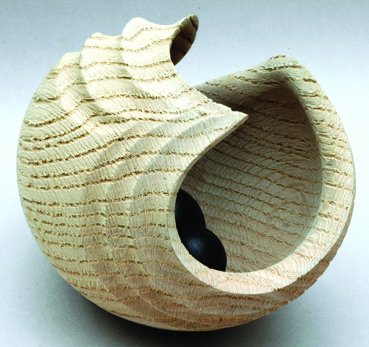 Woodturning captured my imagination and eventually became my specialty. 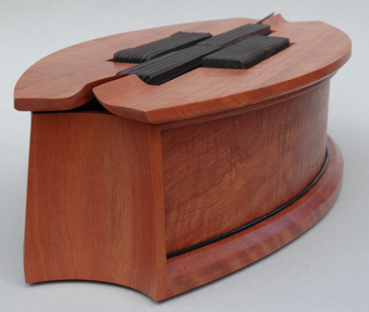 Once I moved into full-time secondary school teaching, I continued to develop my own work and style. I also began to exhibit, entering competitions and selling to shops, galleries and collectors. 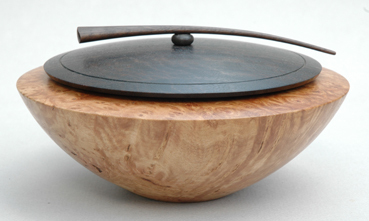 I also teach woodturning to adult classes and demonstrate to clubs and the general public. Contact me for further details. 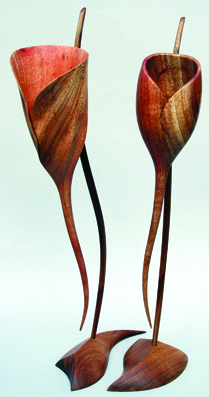 Woodturning is now my passion. I continue to push myself to improve the quality of my work and to develop new and innovative designs. that I could convert into whatever I needed. color, smell, feel, grain and any other intrinsic quality it may have. something about our culture and world”. 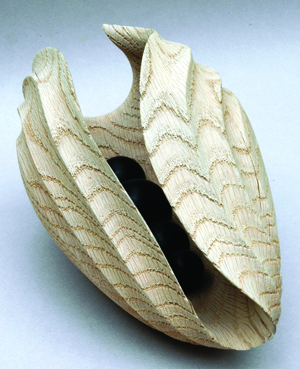 2008 DysFUNctional, Woodturning Center, Philadelphia, U.S.A.
2007 Pacific Connections, del Mano Gallery, Los Angeles, U.S.A.
2005 Small Treasures, del Mano gallery, Los Angeles, U.S.A.
2003 Turned Wood, del Mano Gallery, Los Angeles, U.S.A.
2000 Turned Wood: Small Treasures, del Mano Gallery, Los Angeles, U.S.A.
1999 Selected works, del Mano Gallery, Los Angeles. 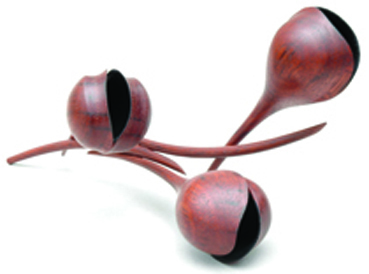 U.S.A.
Australian Woodturning – The Best of Australian Wood Review, Interwood Holdings Pty. exhibition reviews and instructional articles to every edition for the last seven years. 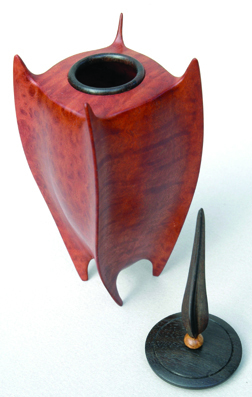 Wustum Museum of Fine Arts, Wisconsin, U.S.A.
Wood Turning Center, Philadelphia, Pennsylvania, U.S.A.
Texas State Bank Corporate Collection, McAllen, Texas, U.S.A.
Mr. Glen E. Roney, C.E.O. Texas State Bank, Texas, U.S.A.
Dr. Irving Lipton, Van Nuys, California, U.S.A.
Mr. Ronald C. Wornick, Burlingame, California, U.S.A.
Mrs. Fleur Bressler, Maryland, U.S.A.
Mr. Tim & Mrs. Cheryl Kotchman, Maryland, U.S.A.
Mr. Bruce Kaiser, Delaware, U.S.A.
Mr. Joseph Seltzer, Philadelphia, U.S.A.
Susan Feiner, New York, New York, U.S.A.
2000 Good Shepherd Lutheran Primary School, crucifix for reception area. 1999 Luther College, Croydon, design and creation of outdoor sculpture. 1999 Good Shepherd Lutheran Primary School, crucifix and candleholders for altar.